Magnolia Vandiver ’21 competes in the Poetry Out Loud competition at George Stevens Academy. Vandiver won the competition and will represent the school at the Northern Maine Regional Competition in January. Magnolia Vandiver ’21 was selected the winner of the George Stevens Academy schoolwide Poetry Out Loud competition in December. Asha Kirkland ’19 was named runner-up. 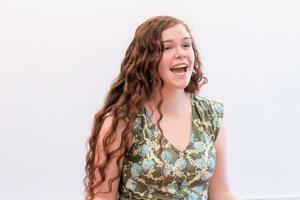 Poetry Out Loud, a poetry recitation competition organized at the national level by the National Endowment for the Arts and the Poetry Foundation, is administered in Maine by The Maine Arts Commission. English teacher Maria Johnson organized the GSA event and introduced the competitors. Vandiver, Kirkland and Jon Robbins ’19 each recited two poems, one contemporary and one from before the 20th century, in front of a panel of judges. Vandiver recited Author’s Prayer by Ilya Kaminsky and The New Colossus by Emma Lazarus, the poem cast in bronze for display at the Statue of Liberty. “I was shocked to win,” said Vandiver in a release, who chose Author’s Prayer for its imagery and The New Colossus because, “although it was written in the 1880s, it seemed so fitting and apropos” to today. To practice, she said she repeated the poems aloud for 30 minutes to an hour each week. Kirkland recited No Coward Soul Is Mine by Emily Brontë and The Albatross by Kate Bass. Robbins’ two poems were Rita Dove’s Banneker and A Birthday by Christina Rossetti. Every competitor, said judge Michael Kazmierczak, made a “wow-level connection to the audience” at one moment or another during their recitations. 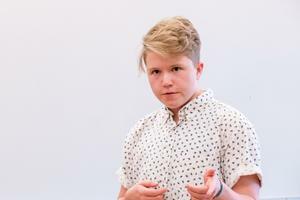 According to the release, Kazmierczak and the other judges, Martha Horne and Bill Case, all GSA teachers, praised the participants and encouraged them to continue reading and reciting poetry. Accuracy judge Sue Jellison, score tallier Elisabeth de Sévigné and prompter Lucy Morison ’20 helped with the event. Jellison and de Sévigné also are teachers at the school. 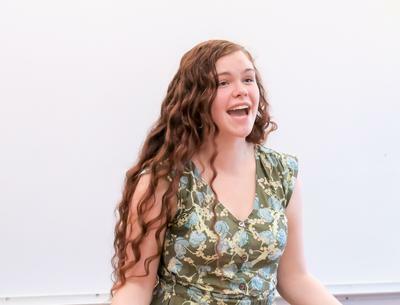 Vandiver will compete in the Northern Maine Regional Finals at the Hampden Academy Performing Arts Center on Tuesday, January 29, at 3 p.m. For this, she must select and learn a third poem, which she said will be longer than the first two. If for any reason she cannot compete, Kirkland will take her place as runner-up. Five finalists from that competition and from the Southern Maine Regionals will go on to the state finals in Waterville on March 11, from which a student will be selected to represent Maine at the national competition in Washington, D.C., in mid-spring. 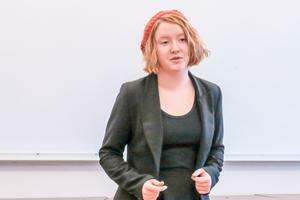 Asha Kirkland ’19 competes in the Poetry Out Loud competition at George Stevens Academy. Kirkland was named runner-up. Jon Robbins competes in the Poetry Out Loud competition at George Stevens Academy.